You’re an IT manager; how do you feel about AV/IT convergence? Think about high-bandwidth video streams flooding throughout your network. If you’re an AV manager, are these flowing packets really going to reach your video walls? If all that sounds like a hassle, this short guide aims to be mutually beneficial. This is a fact: The professional AV industry is transitioning to IP. It already happened for control and for audio; Ethernet ports are everywhere. For video, it is finally happening now. Why? Previous circuit switching methods like HDBaseT, and their proprietary matrix switches may be dead due to cost, scale, and complexity reasons. AV convergence streamlines audiovisual designs to make AV systems simpler, more scalable, and less expensive. 1. Is the type of codec or compression used in the video-over-IP solution important for the backend network? No! There are no “good” packets without video artifacts, or “bad” packets with video artifacts. There are only packets that get reliably forwarded—it doesn’t matter from an Ethernet switching standpoint. 2. Is the latency important for the backend network? No—even if you have zero-millisecond latency goals. Ethernet switches’ latency, when moving packets from one port to another, are measured in microseconds (for instance, two thousandths of a millisecond), which is irrelevant. 3. Is the bandwidth required by the video-over-IP solution important? Yes! This is an essential parameter. When packetizing your video into “streams” of IP packets, it is important to know if you are producing streams of 1 gigabit per second, or streams of 10 gigabits per second. Ethernet switches will have to support these network speeds, and always in line-rate fashion. 4. Is the type of IP traffic generated important? Yes! This is the other essential parameter. Most video-over-IP solutions leverage Multicast Ethernet for transport. Multicast has proven to be a robust one-to-many form of communication over Ethernet networks: The video “server” or transmitter is sending the packets once, and the Ethernet switches are forwarding this traffic to the one or several receiver hosts that want to receive it. For that reason, your Ethernet switches must support IGMP protocol, with IGMP Snooping, IGMP Querier, and IGMP Fast Leave configured all the way between transmitters and receivers. As an AV manager, you know now how to select off-the-shelf Ethernet switches with suitable network speeds and all the IGMP features above. As an IT manager, how do you implement such AV networking backend? In first place, you need to know if this is isolated installation (dedicated AV network), or if you are going to “extend” an existing network with new “islands” of AV. This is the simplest form of AV over IP, especially when one Ethernet switch is sufficient for all your AV encoders (TX) and decoders (RX). (Remember, there is no such “input” port or “output” port in Ethernet switches, since any port can send and receive simultaneously—it is called full duplex.) You are free to plug your RX and TX nodes anywhere on the switch. Just make sure you have enough ports, and the right network speed available on all ports: 1Gbps if you are using compressed AV-over-IP solution; or 10Gbps if you are using uncompressed solution, like SDVoE. SDVoE enables the performance and flexibility of matrix-based designs in a simpler, flatter architecture. Hardware design is as simple as “how many encoders and how many decoders?” allowing greater focus on software and user experience. You may use either copper RJ45—with or without PoE—or fiber SFP connections. The IGMP Snooping, Querier, and Fast Leave configuration should be set across the default VLAN (VLAN 1) before you can click and play. 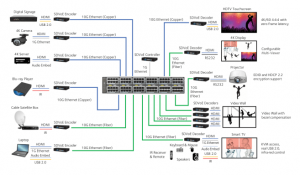 If you deploy several interconnected switches, the links between switches must transport your video streams without a bottleneck. When you do the math, usually several 10Gbps or 40Gbps links are required for the interconnect. The IGMP protocol will need additional settings, such as a distributed IGMP Querier system, or Multicast Router auto-detection mode configured on uplinks ports. To remove that complexity, go with “stackable” switches instead. When stacked together, your switches will behave as a “single” switch—the standalone IGMP Snooping, Querier, and Fast Leave are configured to be sufficient. 1. Network bandwidth capacity (your video streams shouldn’t bring congestion to the existing network core, nor aggregation layers): For network capacity, we must do the math and calculate how many additional tens of gigabits per second the network will need to be capable of, from one switch to the other, and from an AV island to the other. We must remember that IT users shouldn’t be affected—in all cases this should be an increase in network capacity. 2. Flooding prevention (your video streams should be restricted to certain switches where the interested receivers are): To prevent flooding of video packets, the IGMP protocol requires configuration across the entire network. 3. Network security (don’t let anyone hack into your AV installation, and vice versa): Usually it is best practice to allocate a dedicated VLAN for your AV installation, which can be isolated at Layer 2 from the rest of the network. If this is a Layer 3 network with inter-VLAN routing, additional Access Control Lists (ACLs) can protect your audiovisual VLAN. But the good news is that your Multicast traffic will stay “local” in that VLAN—no flooding! Furthermore, if you need to “distribute” some videos outside of that VLAN, Multicast VLAN Registration (MVR) can be useful feature: it will let you specify where other RX in other VLANs can potentially “subscribe” to your Multicast traffic using IGMP protocol. MVR, which is a Layer 2 Multicast feature, should keep things simple for you, as other Layer 3 strategies—for instance, Multicast PIM routing—could bring more complexity. 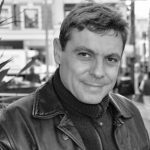 Laurent Masia is product line manager for managed switches at NETGEAR and a founding member of the Software Defined Video over Ethernet (SDVoE) Alliance.